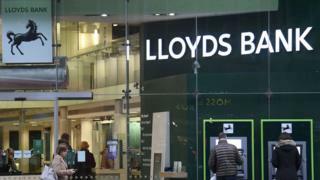 Shareholders in Lloyds Banking Group were "mugged" by the bank and its former directors when they were persuaded to back the takeover of Halifax Bank of Scotland (HBOS). That's according to lawyers for shareholders, who are suing the bank and five former directors. They claim the bank failed to tell shareholders the bank was effectively bust before the transaction completed. The defendants strongly contest the claimants' case. They include former chairman Sir Victor Blank and former chief executive Eric Daniels. "We are saying that shareholders were mugged in this acquisition and should never have been kept in the dark. Disclosure was not made by the Lloyds board," Richard Hill QC, for the shareholders, told the High Court. Shareholders were told in September and October 2008 there had been no significant change in HBOS's financial position when it had suffered a run on wholesale deposits, was surviving on emergency lending from Lloyds and the Bank of England and had gone from being a functioning bank to a failed one, Mr Hill said. "The directors knew it; and they told shareholders the opposite," Mr Hill submitted. "Mr Daniels was informed by government on 17 September 2008 that if he didn't announce a deal by the next day, then HBOS would have to be nationalised." Yet when they announced the deal the next day, the directors made a series of assurances to investors. Sir Victor Blank called it "a good deal for customers and shareholders". Analysts were told had "robust capital" and "very strong liquidity" - even after it was in receipt of $14.5bn of covert financial support from the Federal Reserve, Mr Hill said. The claimants say the glowing description given to shareholders was in contrast to what was told confidentially to the Office of Fair Trading (OFT), which might have blocked the deal due to competition concerns. A confidential OFT document disclosed in court said: "HBOS strongly believes that if the merger with LTSB were not to take place, it would no longer be credible for HBOS to continue as an independent bank without at least some form of assistance from the tripartite authorities." Defence documents submitted to the court refer to support for the acquisition from the regulator at the time, the Financial Services Authority (FSA). Mr Daniels was informed by Lloyds then chief risk officer Carol Sergeant on 1 October 2008 that the £10 billion loan to HBOS "would not be supportable in the normal course of business" but was part of a systemic rescue package and explaining that the FSA should "explicitly endorse the position". On the 2 October, Lloyds obtained confirmation of FSA support from FSA chief executive Hector Sants. Then director of wholesale banking Truett Tate told Ms Sergeant by email: "Hector wanted it noted, explicitly and word for word, that 'he was absolutely involved, in every aspect of the transactions, and supported it to the detail'. He added that they were very keen to have the deal go through and indeed felt that 'everyone' was increasing committed past the point of no return."